On the day I took this I wasn’t planning on taking any pictures as I biked to work, but since I don’t get opportunities like this very often I thought I would stop for a few minutes and see what I could get. It was early morning so there was not a lot of light, but I needed a shutter of at least 1/90 second to minimize any motion blur. That meant a wide aperture of f/2.0 since I was trying to leave my ISO low, though in retrospect if I knew I was going to do a black and white version of the picture I would have probably stopped down to f/4 or smaller and bumped my camera up to ISO 1600. The foreground and background are each just a bit out of focus thanks to using such a wide aperture, but overall I’m fairly pleased with how this composition turned out. When I was working with this image in Lightroom I wasn’t quite happy with how the original was looking, and soon I realized that it was the colorization of the whole composition. As you probably know by now I don’t do much black and white photography, but this one seemed like it would work out quite well so I tried a couple different filters and eventually settled on a modified version of Lightroom’s green filter. 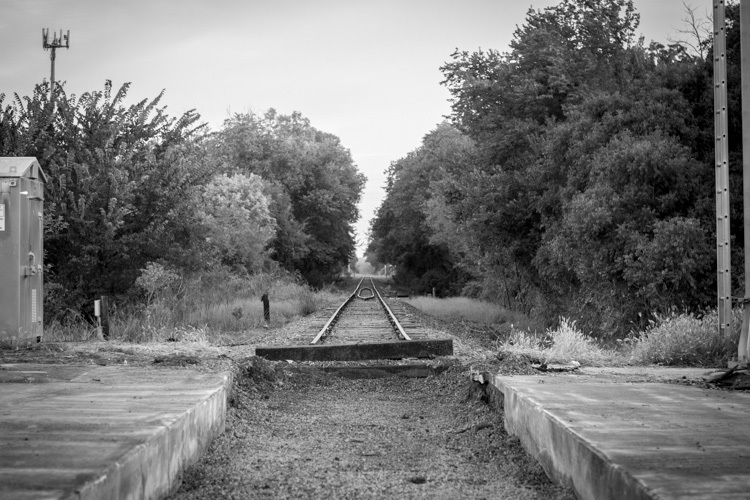 (If you’re not sure about how black and white filters work, here’s an article I wrote for DPS that explains things a bit more) I like the way your eyes are drawn to the rails and the horizon, whereas in the original the focal point was less clear. This also imbues the picture with a twinge of nostalgia for me, perhaps because my dad worked on the railroad for nearly 40 years and I have so many memories of scenes like this from when I was a kid. I also had to crop the image quite a bit from the original that you can see below, and as usual I added just the faintest touch of post-crop vignette too. With all that being said, I just want to close with a bit of an imploration: your life is worth far more than a picture, and please keep this in mind when deciding whether to go for a particular shot or not. When it comes to trains and train tracks, stay away and admire them from afar. 1. I could not find the word “imploration” in the dictionary. 2. You state “crop the image quite a bit from the original that you can see below”. There was no picture below in the version of the article that I received. Thanks for pointing out the missing photo, Chris. I just added it. I hear the train a coming, it’s rolling down the tracks, and I ain’t seen the sunshine since I don’t know when . . .
Nice shot, it speaks volumes about “the end of the line” in so many ways. 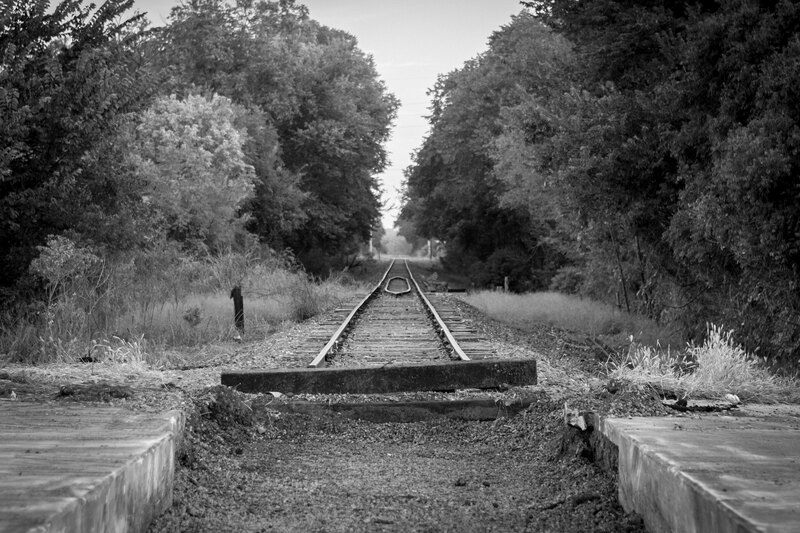 Before you even moved to Havelock, the train tracks running between Colfax and Seward, used to take us kids out past Mahoney Park, which was just a cow fields, and onto Steven’s Creek. I am glad someone had the good sense to make hiker/biker trails along the route. In some cases, those routes lead one from Beatrice into Omaha. Perhaps, someone down there in Oklahoma will have the good sense to refurbish the end of the line into walking trails, as well. Who knows? Perhaps you’ve claimed a last piece of train track history for this quaint looking spot. Nice work, Simon. Learned some valuable tips in this post, Simon. Thank you! As always, loved your images! Nice photo today! Black and white does impart a sense of age and antiquity to a photo. I thank you for showing the use of the green filter and how much it changed (darkened/highlighted) the original photo. The cropping you did is also instructional as you eliminated the building; utility pole? on the left; and, the metal sign pole on the right. Thank you for your effort in making the site so enjoyable. Please consider this note my imploration that you continue the good work! I don’t really like it, especially with the red flag on the side which I removed in Lightroom. I wasn’t so big on B&W filters for a while, but have since discovered that when used with a specific purpose they really can enhance a photo.